WASHINGTON — Investors continue to fund space startups at an accelerating rate, according to two firms that track activity in the sector. Venture capitalists poured $3.25 billion into space technology companies in 2018, an increase of 29 percent, according to Seraphim Capital, a London-based venture fund focused on space. An annual report from Space Angels, which unlike Seraphim does not include drone startups in its count, tallied $2.97 billion in space startup equity investments last year. Space Angels said the 2018 total counts for a sixth of all the equity capital invested in space companies since 2009. Both firms identified launch as the single largest area of investment activity, totalling between $1.3 billion and $1.6 billion, according to their estimates. Space investments were more geographically diverse in 2018 than previous years. Seraphim Capital said European companies grew their share of global investment from 13 percent to 18 percent compared to 2017, with satellite and component manufacturing as a bright spot. China counted for 5 percent of global space investment over the past 10 years, according to Space Angels. Space Angels pronounced 2018 the “Year of Small Launch,” thanks to Rocket Lab completing its first three orbital launches while competitors made significant progress toward their own debuts. It expects 2019 to be the “Year of Commercial Space Travel” with Boeing and SpaceX due to conduct commercial crew test flights for NASA this year while both Blue Origin and Virgin Galactic intend to fly their first passengers to suborbital space. Although launch remained the largest area of space investment activity in 2018, the amount of capital flowing into the sector remained essentially unchanged from 2017, according to Seraphim. Investment in spacecraft manufacturing ventures was likewise flat year over year. Other areas saw reduced investment in 2018. 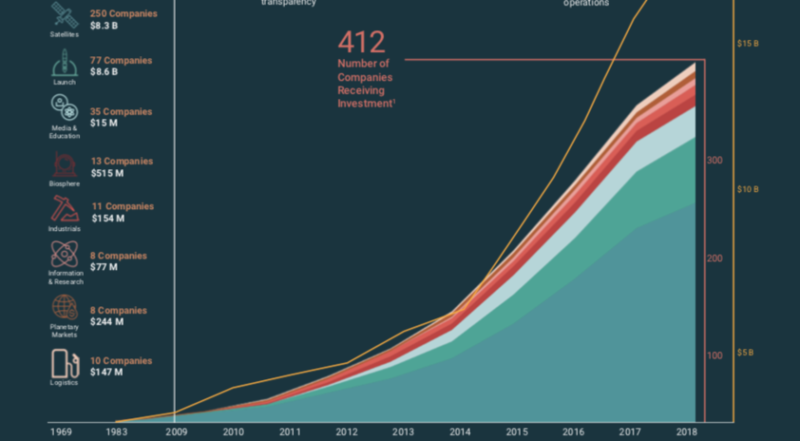 Investments in ground segment companies that link satellites back to Earth, for example, totaled $110 million last year, down from $127 million in 2017. Seraphim said investment in companies focused on analyzing satellite imagery and other data took a steeper dive, from $410 million to $275 million. Seraphim attributed the decrease to the absence of “mega-rounds” like the $164 million Series C round Mapbox raised in 2017. Satellite constellations and airborne platforms used for collecting and disseminating data — two areas Seraphim lumped together for its count — rose by 27 percent to $845 million. Seraphim included Cloud Constellation’s December announcement of a $100 million investment in its count, but Space Angels did not because Cloud Constellation said the investment wouldn’t close until early 2019. 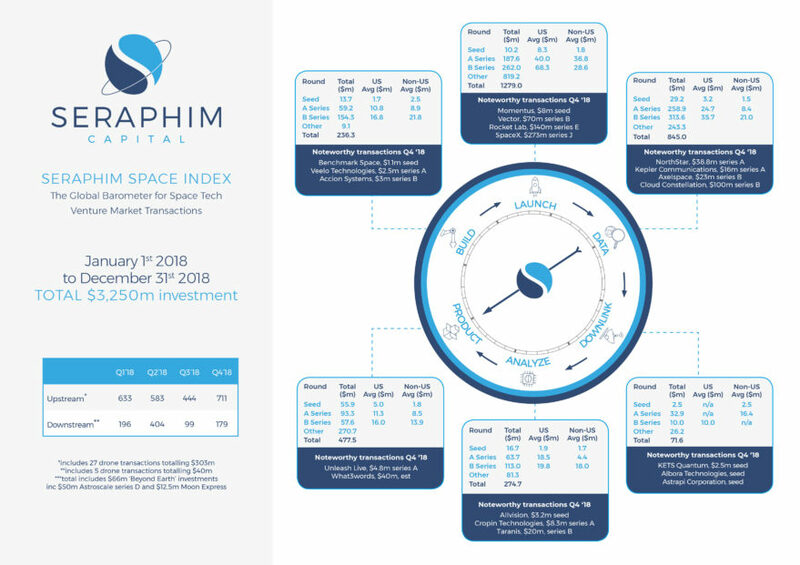 Seraphim Capital, which includes some drone companies in its research, counted $3.25 billion in space sector investments in 2018. Credit: Seraphim Capital. 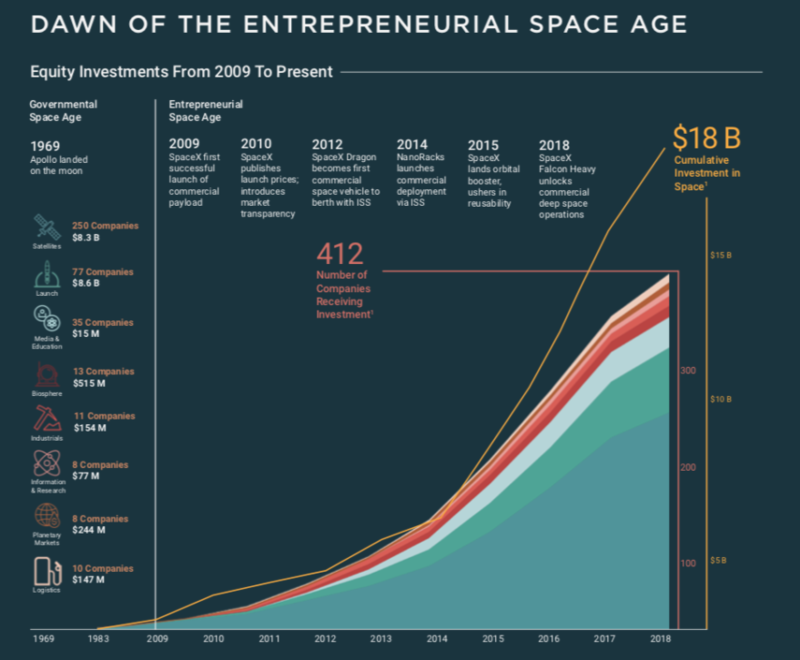 Space Angels counted 534 venture capital firms that have invested in space since 2009, with 114 making their first-ever investment in 2018. One in four investments were Series B rounds, Space Angels said, marking a 250 percent increase over 2017. The bulk of venture capital money continues to go mainly to seed and Series A rounds, Space Angels said.